Recent wildfire incidents have highlighted the high fire risk that exists in some parts of Scotland and Northern England. 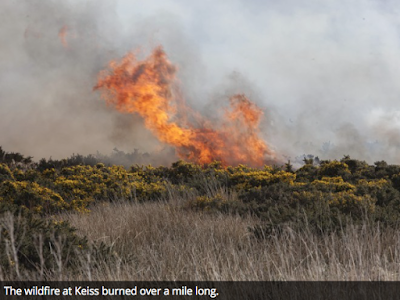 The Press & Journal article describes fires at Keiss, on the coast north of Wick, and in Glen Nevis. This reports highlights the effort required by Fire & Rescue Services to tackle these incidents. the photo shows the fire at Keiss and the large stand of European Gorse, which appears to have had little recent management, is a huge fire risk and a large problem for firefighters if they have to control the fire. Some better preparation and planning for wildfire, which we will be recommending as part of the review of the Muirburn Code, will help to reduce the scale of the problem faced by the Fire & Rescue Services and the risk of damage to the land.